taken my fancy this week. Kate Walsh’s second album Tim’s House, so named because it was recorded in the eponymous buiding of a friend’s home, became a surprise hit on iTunes in 2007, after the track Talk of the Town was given away free and consumers decided to check out the rest of the album. 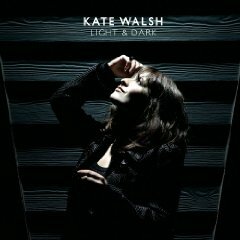 This week saw the release of follow-up album Light & Dark, and thankfully the jaunty nature of lead single June Last Year belies the continuing beautific fragility of Walsh’s songwriting. The title track – first unveiled to live audiences shortly after the release of Tim’s House – is a bewitching example of powerfully frail heartmeltery, and album opener As He Pleases sours powerfully whilst understanding that true art lies in reiging in the excesses of the emotional. This entry was posted in Selection Box and tagged album, kate walsh, new release on September 2, 2009 by Patrick.